This is not a complete drop in trigger! This kit contains the parts described. 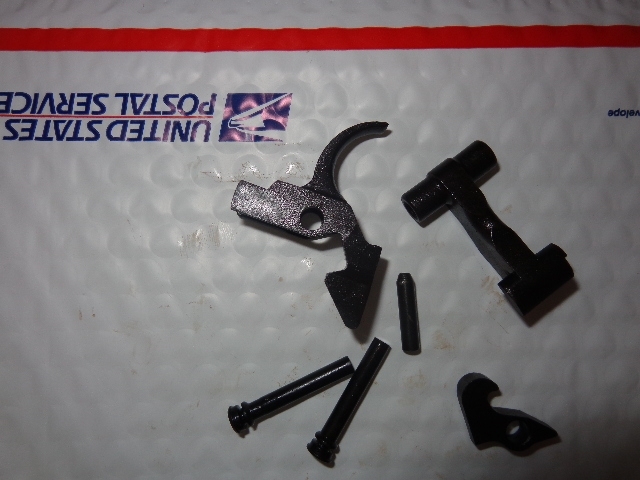 trigger,hammer, diconnector, slave pin, and 2 axis pins. 6 parts total. As with all replacement parts, these parts must be inspected and tested by a qualified and competent gunsmith, or armorer before use in a firearm. All surplus parts are sold as is, no refunds, returns or exchanges. All parts are intended for legal uses only! The items I have listed for sale are legal where I am selling. Its your responsibility to make sure the item you purchase is legal where you are located and that the intended purpose is legal as well. All parts are sold with the intent to be used as replacement parts for legal semi automatic firearms, and NOT intended to convert any firearm into a illegal firearm. Lee’s Mags LLC assumes no liability and extends no warranty for the safe function of replacement parts. You are responsible for following ALL applicable laws, such as NFA laws, 922R compliance, all Federal State and local laws that may apply, in regards to the use and possession of any parts you purchase from Lee’s Mags LLC. All parts are intended for legal uses only and not for anything illegal! All Sales are final. No Refunds, Returns, or Exchanges. All parts are sold in as is condition. IF the part is New, Please refer to manufacture for warranty issues.